This stunning pearl station bracelet adds a touch of glamour to any style. 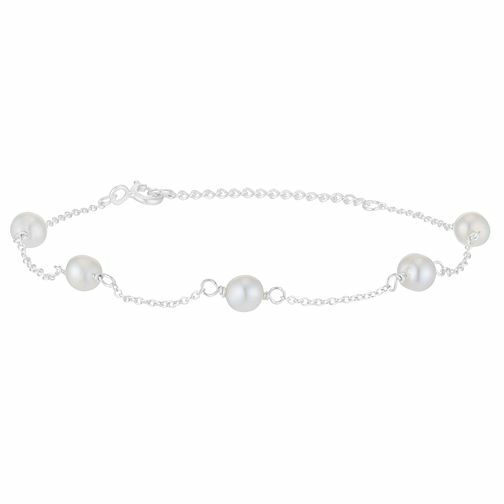 Featuring gorgeous freshwater pearls set on a glistening sterling silver bracelet, this bracelet is the perfect accessory to combine traditional materials with modern design and style. Sterling Silver Freshwater Pearl Station Bracelet is rated 4.7 out of 5 by 3. Rated 5 out of 5 by Anonymous from Very Pretty Bracelet Found this to be the perfect present for my neice as a thank you for doing a reading at my son’s wedding. A great find at half price.